So after an hour of debating, a hour that felt like a day, I decided to call and make a reservation for myself and my buddy, Rory, and to indicate that I wanted this ham. I gave a fake name for the reservation; I don’t know why. But I couldn’t trick Lanny, the manager of the restaurant. When I arrived, he was ready for me. He shook my hand, sat me down, and immediately brought me out some complimentary spicy eight jewels to snack on. I graciously picked at the treat as I waited for my friend. Lanny knew I didn’t need a menu, so I had to ask for one, just to occupy my time while I waited. As I flipped through the menu, I got to read many stellar reviews that they proudly include in their menu, one from Steve Barnes, which I thought was pretty cool. Flipping through the menu also led me to a few conversations with Lanny about various things on the menu that I am not familiar with. When Rory arrived, he ordered some small plates to pick on, and I was sitting around waiting for my honey ham. I stole a pork and leek dumpling or two and tried some of Rory’s Shanghaiese Dough at gunpoint; it’s not for me, but I tried it. My ham finally came out! I was surprised by the presentation. It is advertised to come with pancakes, but, in reality, what they call pancakes are fluffy steamed buns that open up like Pac Man. The waiter put on some food service gloves and started assembling sandwiches for me using everything on the platter. 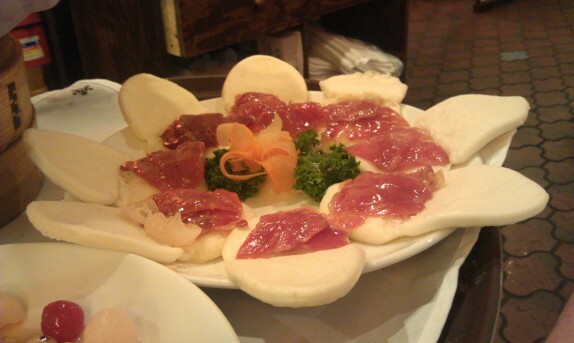 He opened the pancakes and spread the thin slices of ham onto the pancakes. 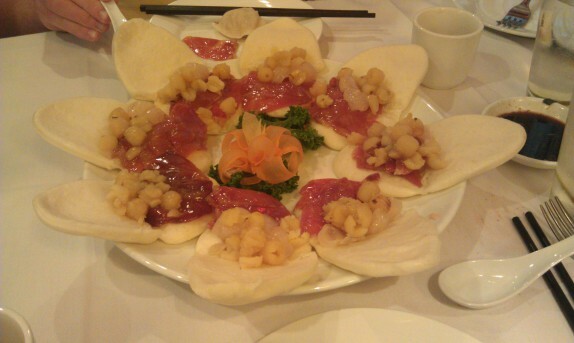 He spread open some of the lychees onto the ham and added some of the steamed, special water chestnuts that were sitting under the ham. There were eight of these guys as part of the dish. I had to share the joy with Rory, so he had one. I was only able to eat three before I asked to take the rest home. The dish was insane. 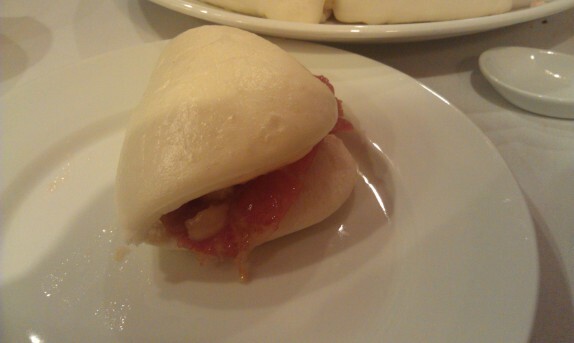 The steamed bun, the medium of delivery for the ham, was fluffy, sweet, and soft. 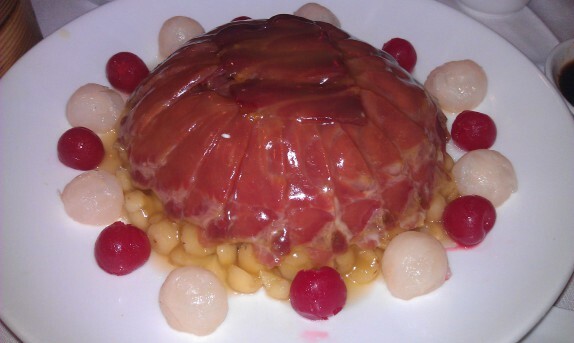 The ham itself was glazed in a honey sauce that was much more sweet than savory. The texture of the ham was unlike any American ham I have ever had; since the ham is dried and cured, as the preparation indicates, it requires a long soak overnight to soften the ham and remove the salinity. In the final product, the ham is chewy and salty, but this texture and taste provides a perfect counterpoint to the sweet sauce glazing the ham. The water chestnuts add a pasty texture to the dish; without this texture, a bite feels flat and boring. The lychee brings its sweet, almost citrus-y flavor to the mix. The price for this dish is $32; it is clearly intended for multiple people, i.e. a family, to eat. 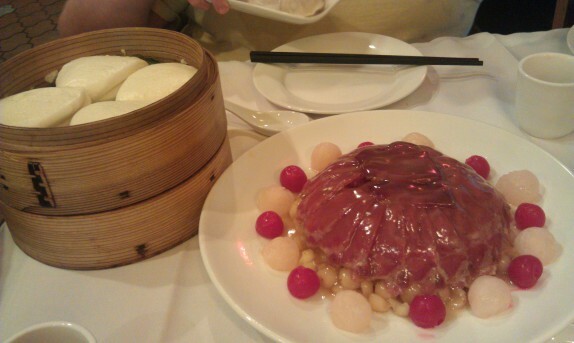 I never intended to share it, nor did I intend to finish the whole dish during my visit. Even though I did share, I still was able to go home with half the dish, so, while $32 seems steep for a dinner, I got two meals out of it (or more accurately dinner and a midnight snack that was enjoyed precisely at 12:03 am), the quantity of food served as well as the amount of preparation that goes into this dish justifies the price completely, at least to me. What also needs to be said: Ala Shanghai is clearly a special spot in the Capital Region of NY. Many area bloggers cover this place over and over, and, if you noticed, they/we have different things to say every time. The menu is extremely diverse; you could order off of different pages on different visits and have completely different dining experiences. The reserve order Honey Ham is nothing short of incredible. 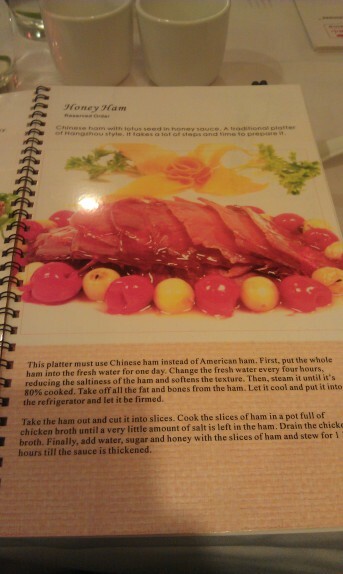 I have had their version of Peking Duck and it was as amazing as the description you have given for the ham. Lanny is the best and Ala Shanghai is our favorite without a doubt.